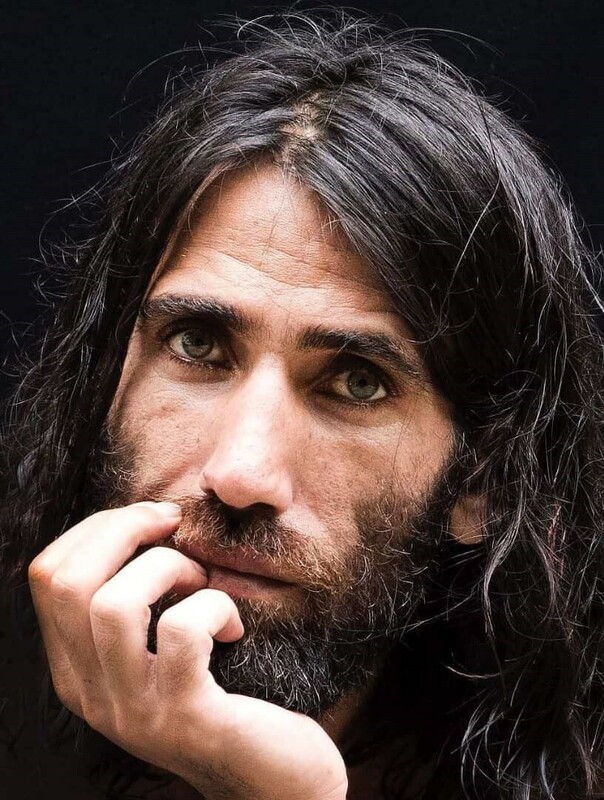 An Asylum-Seeker Wrote A Book By Phone Texts From Manus Island Detention Behrouz Boochani has lived in detention on Manus for five years. He tells NPR about the book he wrote using WhatsApp that tells the story of his failed attempt to flee Iran for asylum in Australia. 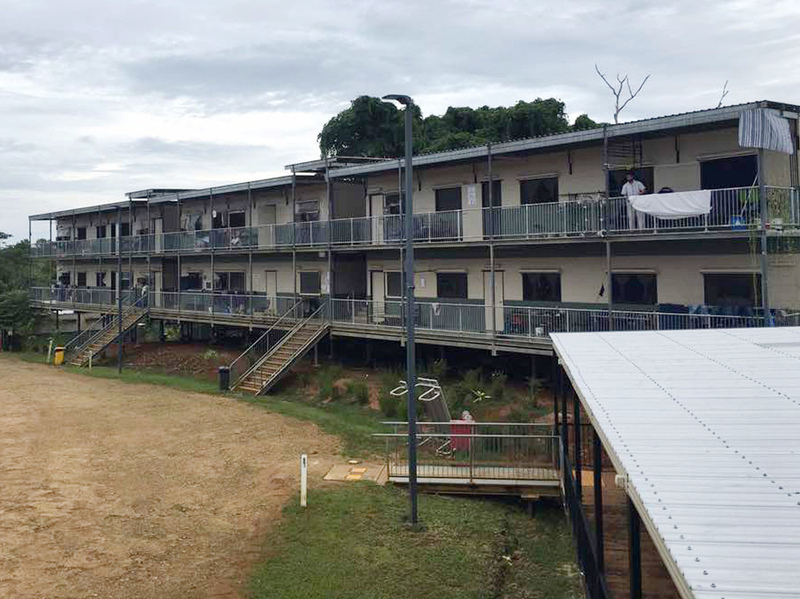 In this July 17 photo provided by Aziz Abdul, a man standing on a balcony at the East Lorengau Refugee Transit Center on Manus Island, Papua New Guinea. The question of what will become of the hundreds of asylum-seekers banished by Australia to sweltering immigration camps in the poor Pacific island nations of Papua New Guinea and Nauru has become more pressing. Proponents of the law said smugglers were profiting, migrants were drowning and the boats had to be stopped. Many opponents see the law as xenophobic and cruel, because once the boats are intercepted by the Australian navy, migrants are held in offshore detention centers for an undetermined amount of time. And as previously reported by NPR, detainees have alleged these centers are rife with abuse. This policy has left hundreds of people in legal limbo, including Kurdish-Iranian journalist Behrouz Boochani. In May 2013, he fled Iran fearing for his safety after his pro-Kurdish magazine, Werya, was raided by the Iranian military. When he tried to cross from Indonesia to Australia, where he wanted to seek political asylum, his boat was apprehended by the Australian navy. According to the Sydney Morning Herald, Boochani was among 75 asylum-seekers intercepted that day. After being detained on Christmas Island for a time, Boochani was eventually transferred to Manus Island, a part of Papua New Guinea. "The Australian government calls this place a camp or an offshore processing center," Boochani tells NPR Morning Edition's Noel King. "But for us it's a prison." Boochani has waited for five years at the Manus Immigration Detention Center. He lives in a small room with five other people, he says, and he cannot return home, nor move forward. Over the years, Boochani has documented his time on Manus Island through various articles and a documentary film, Chauka, Please Tell Us The Time, released last year. All these projects have been written and filmed using a phone he smuggled into the center. 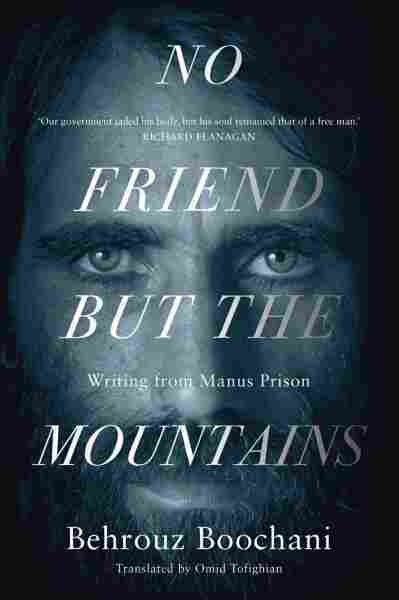 Now he's out with a book titled No Friend But The Mountains: Writing from Manus Prison, which he wrote on his cellphone using WhatsApp. He sent passages to a translator in Australia, who translated them from Farsi to English and then arranged them into chapters. "It was a very long process, a very hard process," Boochani says by phone. A mix of poetry and prose, the book also includes political commentary, psychological analysis, myth and folklore. A review by The Guardian says, "Boochani has created a book that resists classification." "I would like to ask the people, if they want to read it ... they read it as a piece of art," says Boochani. Even though Manus Island's detention camp was ordered shut down in 2016 after it was ruled "unconstitutional and illegal" by Papua New Guinea's Supreme Court, there is still no timeline for moving the detainees off the island. Although the United States has accepted some of the refugees who were held there, Boochani is not sure when he will be let off the island. The following highlights from the interview are edited and condensed for clarity. I was scared from the authorities, anytime they could come and take my paper. So that's why I didn't write it on the paper. I wrote this book on the phone and sent it out bit by bit. I wrote all the book on WhatsApp. WhatsApp was like my notebook. For example, some nights I could write two pages or one page, and send it out to my translator. And when I finish my chapter, I [tell] him that it is chapter 5, or it is chapter 6, or it is chapter 7. My translator put them together in PDF and sent it back to me, and I read it and say, "Yeah, it's OK, it's exactly what I want." So it was a long process, a very hard process. My perspective is very different with people who are in America or other places, people who are free. [The] important thing for me is to write a book to make a challenge against this system, to tell the truth to people, do my work, my duty as a novelist, as a journalist. I don't think about money or getting money. So if I have money, of course I don't know how to use it. It's not important for us. Maybe in [the] future, but right now, important thing for me is [for] people to understand where we have been living and how Australian government kept us in this prison for a long time. I was able to survive in this harsh prison because of nature. Manus Island is very beautiful island. I came from Kurdistan. Kurdistan is very beautiful land. I grew up on nature, so nature is very important for me. I think I could survive because of nature. So that's why I describe many beautiful things in this book. Nature is everything for me. I cannot go back [to Iran], because I had a strong reason to leave. If [I] didn't have strong reasons, I wouldn't stay here for five years now, living in the prison like this. The American government made a deal with Australia so they could accept some of the refugees from here. About 100 people left Manus and they went to America, so they are living in America. We all hope that finally, after five years, we get freedom in a place like America or other countries. This story contains some extra content that did not air in the broadcast version.